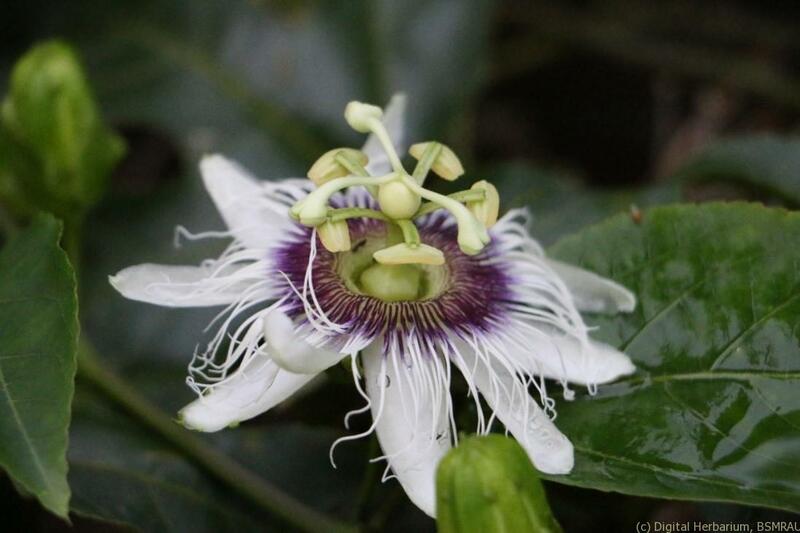 • Passifloraceae are mostly woody or herbaceous climbers with unbranched tendrils that arise between the stipules. 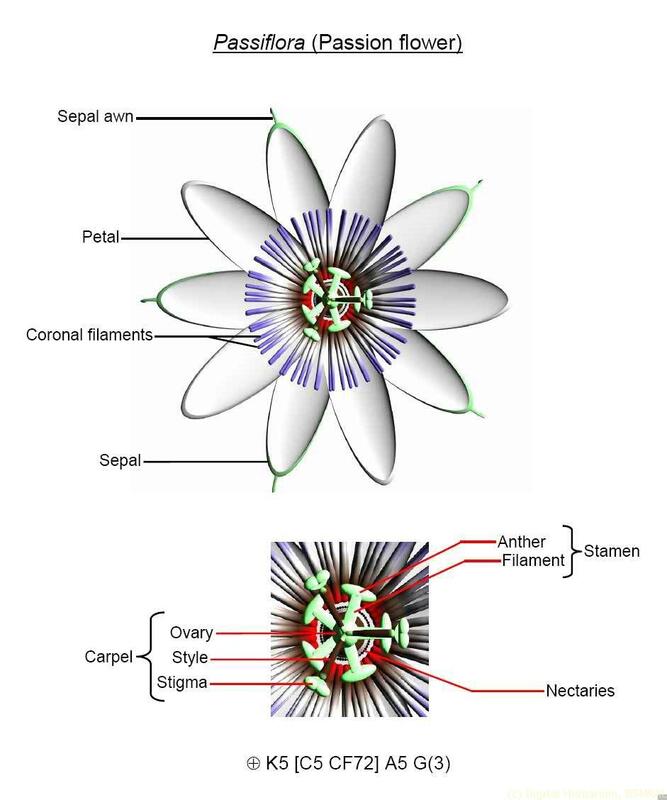 • The stamens and ovary are borne on an androgynophore or gynophore. 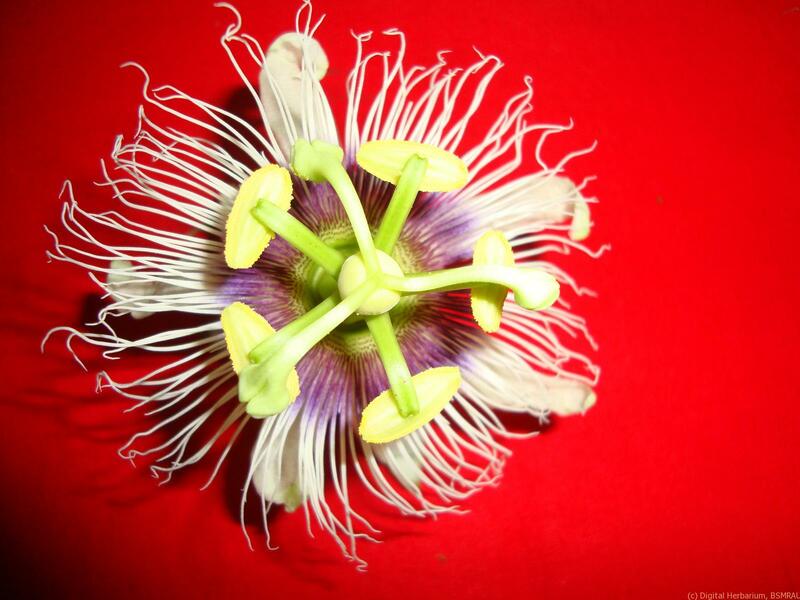 Passiflora is the most species rich genus of both the family Passifloraceae and the tribe Passifloreae. With over 530 species, an extensive hierarchy of infrageneric ranks is required to represent the relationships of the species. The New World species of Passiflora were divided among 22 subgenera by Killip (1938). The Old World species form two clades–super section. Disemma (part of subgenus Decaloba) and subgenus Tetrapathaea. The former is composed of 21 species divided into sections Disemma (3 Australian species), Holrungiella (1 New Guinean species) and Octandranthus (17 south and East Asian species). 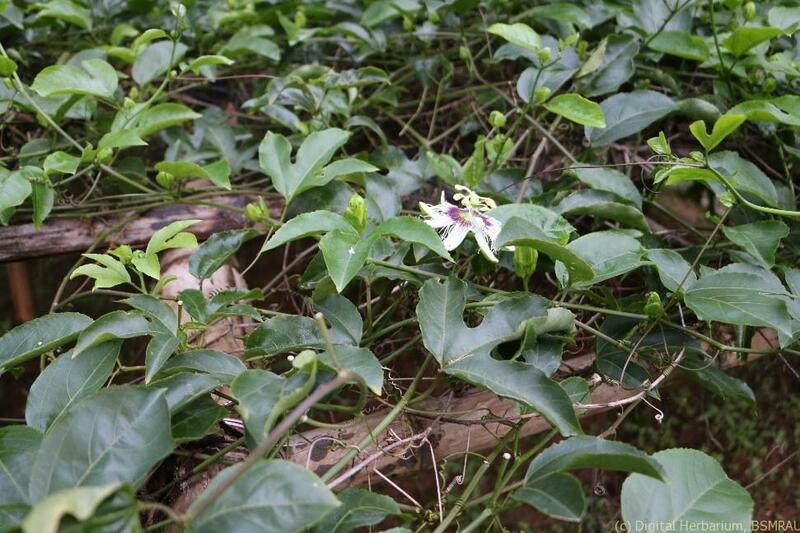 Habit: Herbaceous or woody vines, climbing by tendrils. Stem: The stem is usually solitary, up to 7 cm in basal diameter, extends 5 to 10 m or more into the crowns of trees, and is covered by a thin, flaky, light brown bark. The stem-wood is light and brittle. The twigs are yellow-green, turning brown, and support themselves on vegetation by means of tendrils that arise at the leaf axils. Leaf: Leaves alternate, entire or lobed. Inflorescence: solitary or in mostly cymose inflorescences. 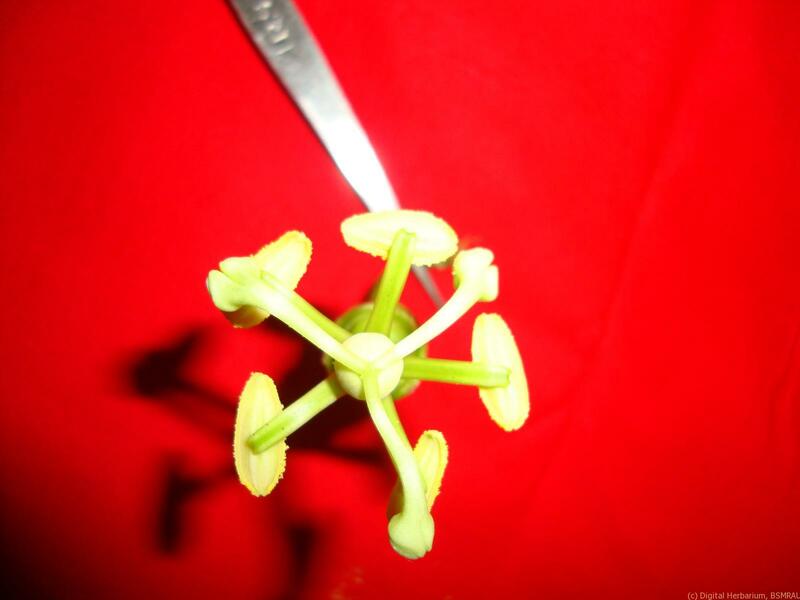 Each single flower derive from a reduced cyme: the central axis developed into a tendril with a single lateral bracteole. Calyx: Commonly with extrafloral nectaries (glands) on the petiole; stipules usually present. Sepal 5, free or connate below. Corolla: Petals 5, alternate with the sepals, free or on a gynophore; an extra-staminal corona of one or more rows of filament-like processes, membranous appendages or scales often present. Androecium: Stamens 4–10, free or on an androgynophore. 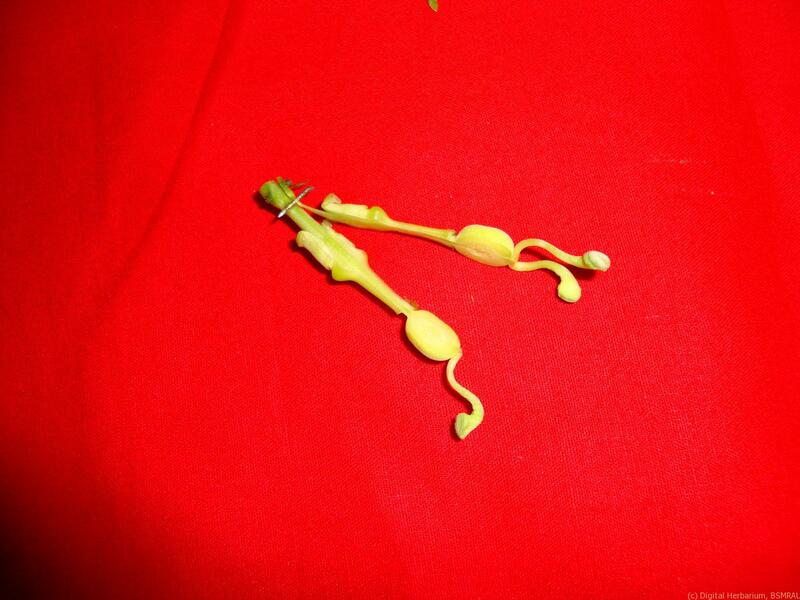 Gynoecium: Gynoecium of 2–5 carpels united to form a superior 1-locular ovary which is sessile or on a gynophore; placentation parietal, placentas 3–5; styles 1 or 3–5, usually connate at the base. Styles with a capitate, clavate, or discoid stigma. Fruit: Fruit a berry or capsule. 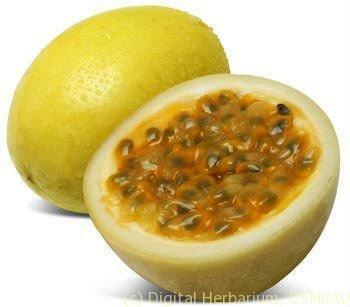 Seed: Seeds usually many, commonly pitted, with a fleshy aril.